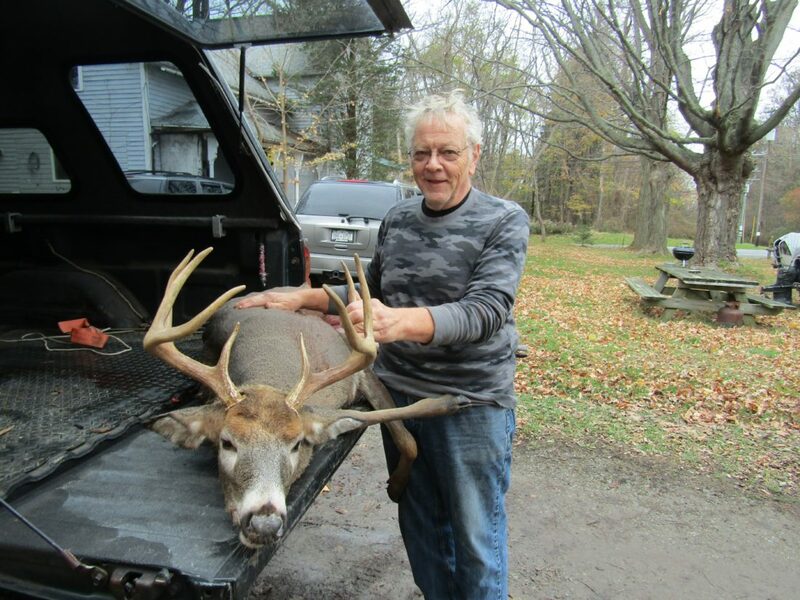 Jim Miller of Grand Island displays a nice 8-point buck taken on Opening Day. Happy Thanksgiving! What comes to mind when these two words are said, are probably a good hot meal usually turkey and all the trimmings, and football. For the deer hunter it usually means at least a half a day of deer hunting,and for the chief cook and bottle washer, it means a busy kitchen. But there is so much more to give thanks for: Like living in our great country, with its many freedoms and opportunities. Good health, which is so often taken for granted. Good friends, family and partners. Good weather and good fishing, to name a few. It may not be done every day in many households, but at least once, pause and reflect, and give thanks! Jim Markham at the Department of Environmental Conservation fisheries station in Dunkirk commented that the reports on steelhead fishing in our area are very encouraging, with data supplied by angler diary reports and creel surveys. Trout anglers have been doing well most of the fall when water levels permitted trout to enter the various local streams and creek systems. The numbers thus far are encouraging and similar to those in the early 2000s era. Rick Miller in Irving reported that the smaller creeks like Walnut Creek and Silver Creek are holding fish, but towards the lake, the “Cat” has been a bit murky. Markham commented that while checking on the research boat Argo, the crew observed an angler hook and land a trout while fishing off the Dunkirk Pier recently. My contact on Chautauqua Lake, Skip Bianco, was unavailable this week as he has gone deer hunting. Most hunters that I spoke with commented that they are seeing deer, both buck and does, but they are either too far, too small, or not presenting a good enough shot. There was some snowfall in higher elevations on Sunday, and a lot of hunters were put off by the weatherman’s prediction of strong winds and lots of rainfall on Opening Day. I guess the same weatherman is working that predicts the weather during fishing season. Enjoy the holidays, and hunt and fish safe! 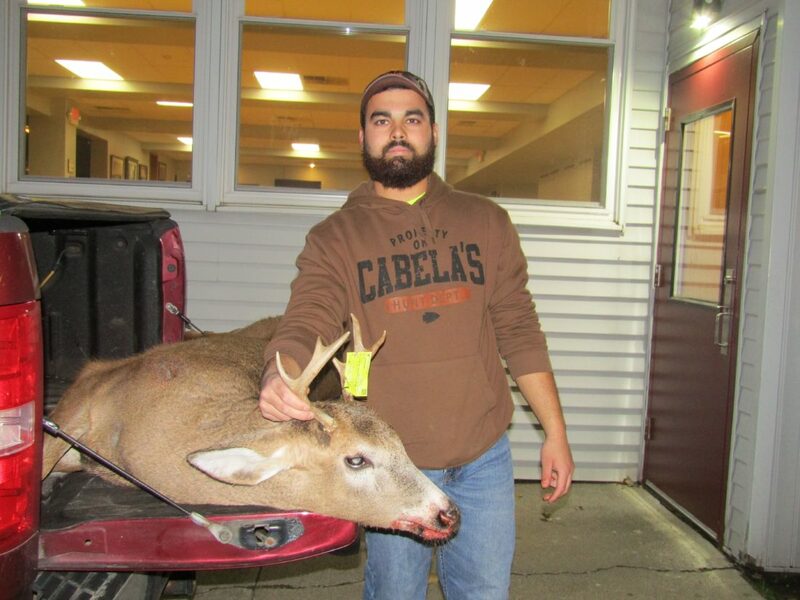 Ryan Ruiz displays a nice 6-point buck he took on Monday evening in the Town of Dunkirk. Attention big game hunters! If you need help locating a big game animal, after exhausting all attempts to find it, call Deer Search at 648-4355. This is a volunteer service that will help, whenever possible, with a high percentage success rate. Our local chapter of the National Wild Turkey Federation, The Lakeshore Long Beards, announced at the Wednesday meeting that the annual banquet/fundraiser will take place on Jan. 20, 2018. This is the 20 year anniversary for the Long Beards. 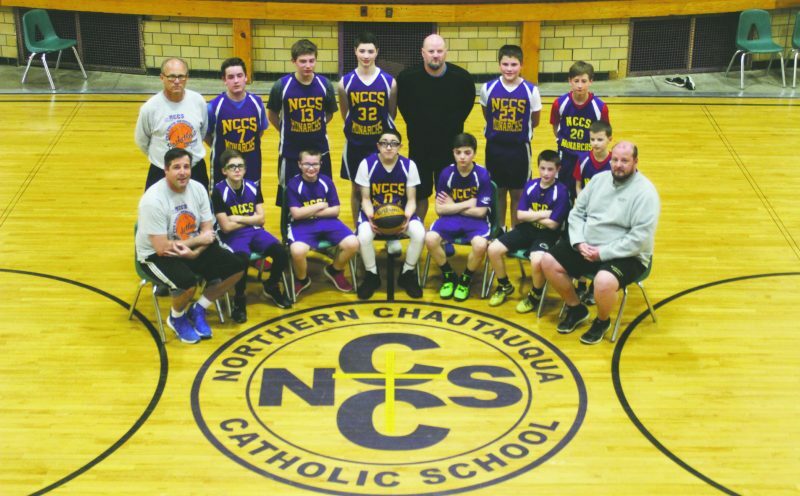 The Northern Chautauqua Conservation Club will continue this year with their Hunters Helping the Hungry program. Club members are urged to bring one non-perishable food item (canned food or water) on Tuesdays. This year, the need is greater than ever. Thank you for your help! Correction: There will be a pistol course on Wednesday, Nov. 29, from 5:30 p.m. until 10:30 p.m. at the Northern Chautauqua Conservation Club. There is a mandatory fee of $75 for this course. For information contact Gary Dudek at 366-3397. On Dec. 16 and 17, there will be a gun show at the Harborcreek Fire Department, Social Hall located at 7275 Buffalo Road, US Route 20, located between North East and Harborcreek, Pa.
On Jan. 27-28 there will be a gun show at Conneaut Lake, Pa. at the Conneaut Lake Sportsmans Association located at 11861 Sportsman Road (off Rte. 18). Monday night, free fly tying courses at the Northern Chautauqua Conservation Club are from 6 p.m. until 8 p.m. Tying vises, instruction and materials are all provided free. No registration is necessary. The Northern Chautauqua Conservation Club is located on Mullet Street Dunkirk. Turn towards the lake at the Country Fair store located on Lakeshore Drive west (Route 5). The Children of the Stream Youth Fly Fishing Program will be starting its 18th year of providing weekly free fly tying and fly fishing classes to both youths and adults in our area. Classes will be on Tuesday evenings from 7 p.m. until 8:30 p.m. at the Costello Community Room (P84) in the new addition to the Rockefeller Arts Center at SUNY Fredonia. You do not need any prior experience to attend these classes and the course is geared towards ages 10 and older. For more information contact Alberto Rey at 410-7003 or alberto@albertorey.com. Note: If you have a big-game fishing or trapping success story you would like to share, call 366-1772, or 467-2079, and leave a name, phone number and a time you can be reached. You can also call 366-3000, ext. 5, after 6 p.m. or email sports@observertoday.com.